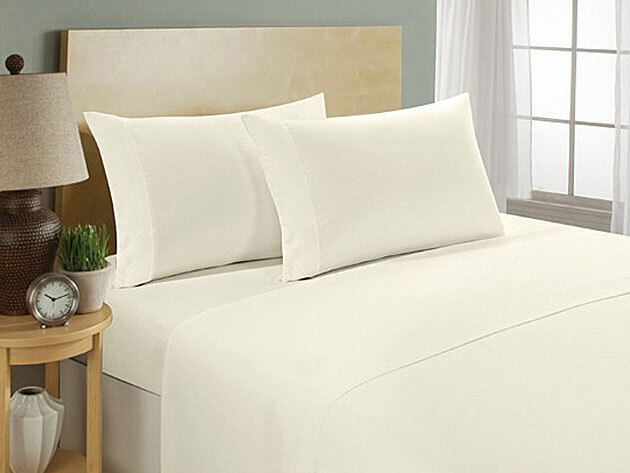 The fact that it's getting darker earlier and earlier could be a bummer — unless you're looking forward to snuggling up at night with this Ultra Soft 1800 Series Bamboo Bed Sheet Set. Made out of a mixture of high-quality bamboo yarns and high-strength microfiber, this is just the bedding upgrade you need to actually want to turn in early and set an alarm for later. You know that luxurious feeling you get when you stay at a nice hotel and the sheets are wonderfully soft and fresh? Now you can get the same feeling right in the comfort of your own home. Made out of bamboo yarns, these sheets have been mercerized and pre-shrunk to stay soft and wrinkle-free for a long time. And unlike other sheets that lose their shape, these stay crisp, lending a little extra polish to your bedroom decor. The set comes with one flat sheet, one fitted sheet and two pillowcases for your snoozing pleasure — and the fitted sheet will fit even extra thick mattresses with an all-around elastic design and deep pockets. Usually this set is $49.99, but you can get all of them now for $29.99, or 40% off the original price. For a limited time only, use the code: GIFTSHOP15 for an additional 15% off!